We've written lots of word search puzzles online, just for you! We enjoy creating puzzles for folks of all ages on a wide range of subjects, and we try to add new puzzles frequently. Be sure to check back again soon! Here's an easy word search puzzle about an important, everyday topic: E-mail! 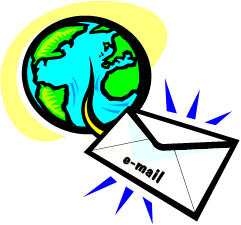 It’s always fun to find new messages in your inbox – unless, of course, you’ve received a bunch of junk mail or spam! See how quickly in you can find words in this easy word search, which contains just 20 words. Answers can read left, right, up, down or diagonally. Be sure to do another puzzle or two from our site before you return to your own inbox! Please note that you can view the answer grid by clicking on the printable version and scrolling down to the second page. Double-Letter Animals - Otters, aardvarks and more! Fun for kids and everyone else, too. Kids' Word Search Assortment - View our entire set for kids. Teachers and parents, these are a fun way for children to practice reading and spelling skills. Canada Word Search - Explore Canada's cities, provinces and natural resources. Baby Shower Word Search - Just one of many of our popular baby shower word games. Color Me Puzzled Word Find - There are myriad of colorful hues to locate in this word game. Space Word Find - An "out-of-this world" experience! Transportation Word Search - A tricky puzzler in an interesting shape. How many of these modes of transportation have you tried? Five-Letter Fiasco - Perhaps our most difficult word search. Are you up to the challenge? Note: We have many more word searches that are more difficult than the one on this page. Of course, the same puzzle that may be easy for you may be difficult for someone else. Answers that appear backwards diagonally in the puzzle. If you enjoyed solving this puzzle, please try more of our easy word search games, then move on to the medium and difficult levels. We think you'll like them all! 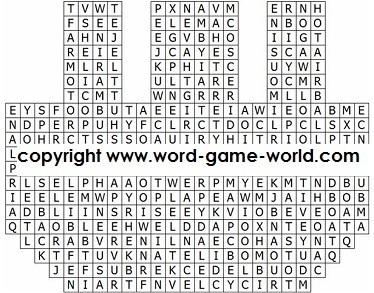 Use the links at the top right of this page to locate these fun word games. We have lots more word search puzzles, along with many easy crosswordpuzzles, anagrams, cryptograms, word scrambles and more.